Play of all kinds has meaningful benefits for kids. Blocks and loose parts play promote academic success in mathematics and language skills1 2 3. Traditional playgrounds increase physical activity and lower levels of obesity in youth and adolescents4 5. Additionally, children engaging in dramatic play have increased empathy, more imagination, and higher levels of self-control6 7. However, there is little research examining young children's engagement and play behaviors with large, easy-to-handle blocks, such as those found in Imagination Playground™ sets, and how these play behaviors compare to the behaviors in other play environments. In September 2012, Dr. Jim Elicker, Assoc. Professor, Human Development & Family Studies at Purdue University, led a collaborative research project, sponsored by the A.L. 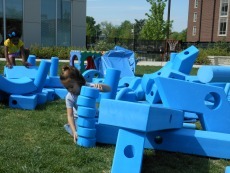 Mailman Foundation and KaBOOM!, to investigate the impact of large-scale block play on the behavior of young children. Document the early engineering, physical, and social competence behaviors of young children (3 to 5 yrs.) 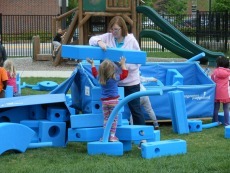 as they engage in free play, indoors and outdoors, with Imagination Playground™ Blocks™. In this case, early engineering behaviors are defined as exploratory, inquisitive, constructive, and creative behaviors that resemble traits highly desirable in engineering design8. Explore similarities and differences in girls' and boys' play behaviors with the Imagination Playground™ play materials. To conduct this research, Purdue University partnered with two preschools. The Ben and Maxine Miller Laboratory Preschool is located at Purdue University in West Lafayette, Indiana and offers year around programming for children 6 weeks to 6 years. The preschool also maintains positive relationships with off-campus community early education programs such as Head Start. The Miller Preschool serves University faculty, staff, and student families, including 65% White, 25% Asian, 1% African American, 1% Hispanic, and 5% other ethnicities. The Bauer Family Resources Head Start Program, located at Durgan School in Lafayette, Indiana, promotes school readiness by enhancing the social-emotional, physical, language, and cognitive development of children ages 3 to 5 through the provision of comprehensive services that include educational, health, nutritional, social and other services to enrolled children and families. Head Start serves children and families who have income below the U.S. poverty level. The program has children who are White (46%), African American (19%) and Hispanic (29%). The research project began in the autumn of 2012 with the development of the observation instruments; training, practice, and reliability testing of data collectors; recruitment and orientation of participating preschool programs and teachers; and recruitment and informed consent with children and families. Research observations began at the two preschools in early February, 2013 and continued through mid-May, 2013. Positive and negative social behaviors, including taking turns, sharing, displaying aggression, hitting, shoving, and cooperation. Gross motor movement, such as walking, running, jumping, throwing, catching, and lifting and fine motor movement, which includes drawing, painting, and manipulating small objects. While play in each of the settings incorporated elements of early engineering play, there were significant differences between the three environments. 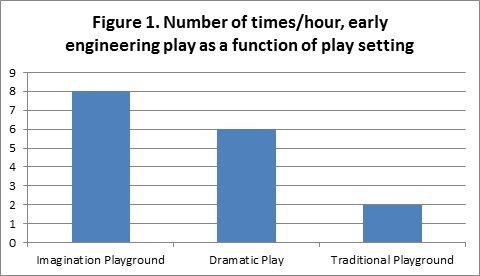 Imagination Playground™ play had the highest number of observed engineering behaviors-- approximately eight times per hour, followed by dramatic play at six times an hour, and traditional playground play at two times per hour. 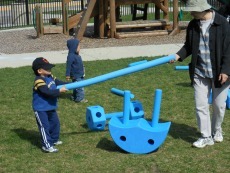 Additionally, there was twice as much constructive play on the Imagination Playground™, compared to the Dramatic Play area, and ten times more constructive play than that observed on the Traditional Playground. Business leaders and many politicians all agree that the future viability of the US economy will be highly contingent on having young innovators create new or improved ideas, products, and services. Moreover, the impact of this creative economy will be most positively felt in the areas of science, technology, and engineering9. This has led many educational leaders to take up the movement of teaching 21st century learning skills, such as critical thinking and problem solving, communication, collaboration, and innovation, as a means of preparing students for this new economy. 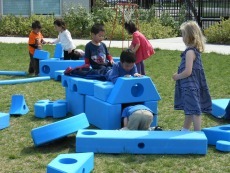 It is clear that all types of play, but perhaps especially play with loose parts and blocks that encourage building structures and manipulating the environment, is essential to building the foundation for critical thinking, problem solving, and creativity, as well as science, math, engineering, and technology (STEM) education. Teachers and other play facilitators can enrich children’s STEM-related play by using science and technology concepts and words when describing play and facilitating problem-solving with children. Play is active! Fine and gross motor skills were displayed in all three settings. However, there were statistically significant differences across the settings. 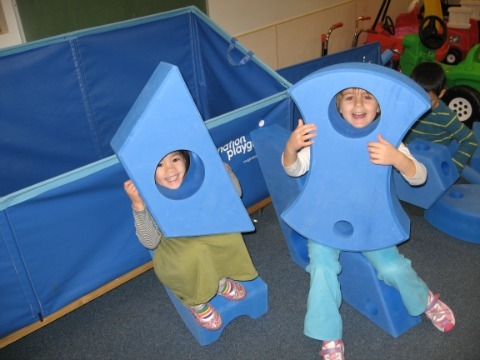 For whole body gross motor movement, the Imagination Playground™ was by far the most active, while dramatic play had the most instances of fine motor play. 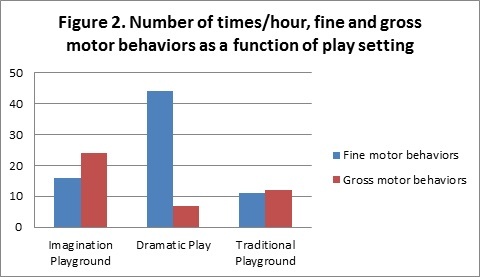 In fact, gross motor movement in the Imagination Playground™ area was seen twice as frequently as in the traditional playground. This is a surprising result, which supports the inclusion of large loose parts in an early childhood program to promote physical fitness and coordination. The preschool years are critical to developing motor skills. One reason for this is that children have their highest level of Betz cells prior to age 7. Betz cells, located in the basal ganglia, are some of the largest motor neurons in the human nervous system and are critical for motor skill development10. This means parents, care takers, and teachers should be promoting different kinds of play, particularly during early childhood, to promote different types of motor skill development. Moreover, between ages 7 and 11, there is up to a fifty percent reduction of Betz cells, indicating the potential for optimal motor development declines after this age – and making early childhood motor development all the more crucial11. In all three play settings, positive social play behaviors far outnumbered negative social behaviors, at a ratio of 15 per hour to one per hour. 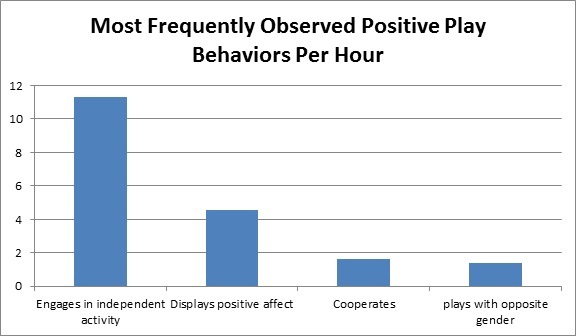 The most frequently observed positive social play behaviors were: engages in independent activity, displays positive affect, cooperates, plays with opposite gender, positive affect towards another, and leadership. This study demonstrated that all play helps to provide children opportunities to practice healthy socialization behaviors that are integral for success later in life and builds on research, reported by the American Academy of Pediatrics, showing that play allows children to learn how to share, negotiate, resolve conflicts, and develop self-advocacy skills12. 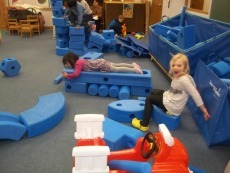 The researchers at Purdue also studied the differences between boys and girls in utilizing the Imagination Playground™ and girls exhibited early engineering play behaviors at the same rate as boys. Girls were slightly more social when using Imagination Playground™ than their male counterparts. This may be important because there are well-documented gender gaps in STEM education and jobs in the US. Women make up less than a quarter of the STEM workforce, and in some fields of engineering that number drops into the single digits13. The sociological and psychological literature clearly indicates subtle discouragement that happens where girls – beginning at the end of elementary school or even before – start to dis-identify with science and math14. The utilization of Imagination Playground™ to foster an interest in engineering and building during early childhood may have long-term benefits in leading more women to pursue STEM fields. The researchers used the two different child care environments as a proxy for socioeconomic status as the children in Head Start programs mostly come from socially and economically disadvantaged families, while children in the Purdue University Laboratory School primarily have parents who are university faculty, staff, or students indicating a university educated and financially stable family life. Despite the socioeconomic differences, overall rates of early engineering behaviors and fine and gross motor activity were the same in the Head Start environment as the Lab School. In recent years, economic standing has outpaced race as the most significant indicator within the academic achievement gap. The achievement gap between children from high– and low–income families is roughly 40 percent larger than it was in the 1960s. Furthermore, research shows that this gap begins to occur as early as kindergarten. While there are a multitude of complex and interlinked causes for the poverty achievement gap in education, a piece of the solution has been Head Start programs for the children in greatest need, as Head Start programs provide the healthy environment to foster cognitive development in early childhood. This research demonstrates that usage of Imagination Playground™ in Head Start programs may augment and improve efforts towards healthy cognitive development, build early engineering interest and skills, and contribute to evening the playing field in early childhood development. These efforts will hopefully shrink the achievement gap due to poverty in the future. The results of this study indicate that Imagination Playground™ may be a useful tool for fostering basic engineering skills and motor skill development in young children, regardless of gender and socioeconomic status. However, this study also indicates that play on a typical playground and in a dramatic setting also have substantial development benefits. This supports previous play research that says kids need a balanced "diet" of play, or rather, a mix of all kinds of play. Play is make-believe, play-dough creations, and blocks. Play is running, jumping, and climbing. Play is games with friends, family, or caregivers, whether on the playground or playing hide and seek. Play is fun and all children deserve a regular and balanced mix of all types of play. The findings from this study build on a growing understanding of the benefits of loose part and block play. However, there are many facets of this topic that still need to be explored. Doing so will provide a more nuanced understanding of how various types of play impact child development. 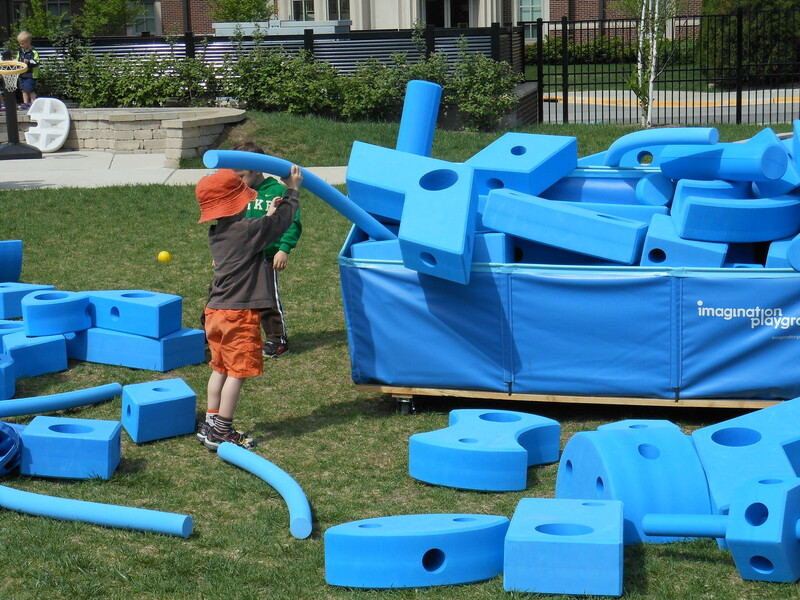 This study looks at the benefits of large-scale loose parts and block play. 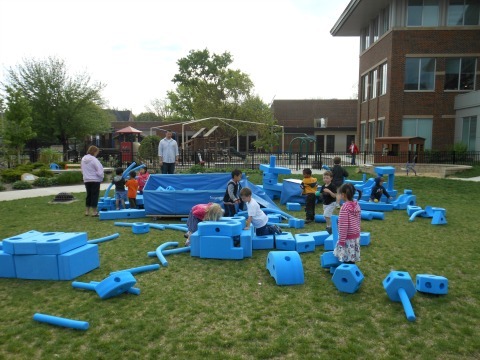 However, in an ideal setting, block play opportunities, such as the Imagination Playground™, could-- and should-- be combined with other types of play, such as play on a traditional playground or in a dramatic play setting, and studying how this impacts child development is needed. To clarify, this study examined the impact of individual types of play, but since some different benefits were seen in each type, a future hypothesis is that combining different types of play in one play experience will compound the beneficial effects. Typically, we think of and understand play as a child-only activity, but, increasingly, parents, teachers, and child caregivers are becoming involved in child play. Studying how different levels of involvement impact play and development could have implications for both child care and parenting. Additionally, as this research has shown, play can have a positive effect on early learning opportunities, regardless of socioeconomic conditions. Thus, training teachers to properly facilitate play experiences may be a possible avenue of improving early childhood education. While this study examined only children 3 to 5 years of age, it is hypothesized that block and loose parts play has positive effects on engineering skills throughout childhood, and further research on this impact on older children would paint a fuller picture of how loose part play benefits children. Play helps to prevent obesity, improve mental health and wellness, and foster a creative and successful workforce. Play boosts problem solving, classroom performance, and resilience. Most of all, play makes kids happy. Yet kids face some barriers to play, whether it is too much screen time, unsafe neighborhoods, or overprotective parents. There is a role for everyone to ensure that every child gets the joyful childhood they deserve by ensuring they are playing every day. We need innovative efforts and bold new ideas in communities across the country. Whether you make decisions for your family or can influence decisions that affect your community, everyone can be part of the solution. To get involved, sign up to take action for play at kaboom.org/subscribe. 1 The relationship between preschool block play and reading and maths abilities in early elementary school: A longitudinal study of children with and without disabilities. (2009). Hanline, MF, Milton S, & Phelps P. Early Child Development and Care, 14; 76-82 . 2 Block play performance among preschoolers as a predictor of later school achievement in mathematics. (2001). Wolfgang, CH, Stannard LL, & Jones I. Journal of Research in Childhood Education 15(2). 3 Effect of block play on language acquisition and attention in toddlers. (2007). Christakis DA, Zimmerman FJ, & Garrison MM. Archives of Pediatric and Adolescent Medicine 161(10) ; 967-971. 4 Places to play: association of park space and facilities with healthy weight status among children. (2008). Potwarka LR, Kaczynski AT, Flack AL. Journal of Community Health 33(5). 5 Neighborhood socioeconomic conditions, build environments, and childhood obesity. (2010). Singh GK, Siahpush M, & Kogan MD. Health Affairs 29(3). 6 Preschoolers' emotional competence: links to pretend and physical play. (2003). Lindsey EW & Colwell MJ. Child Study Journal 33(1). 7 Pretend play and young childrens development. (2001). Bergen D.
8 Talking about artifacts: preschool children's explorations with sketches, stories, and tangible objects. (2010). Evangelou D, Dobbs-Oates J, Bagiati A, Liang S, & Choi JY. Early Childhood Research & Practice 12(2) . 9 Creating innovators: the making of young people who will change the world. (2012). Tony Wagner. New York, Scribner. Print. 11 Designed to move: A physical activity agenda. Developed and Produced by: the American College of Sports Medicine, NIKE, Inc., and the International Council of Sports Science and Physical Education. (2012). 13 Women in STEM: a gender gap to innovation. U.S. department of commerce (2011). Beede D, Julian T, Langdon Dm McKittrick G, Khan B, & Doms M. Economics and Statistics Administration Issue Brief #04-11.